As I mentioned in my last blog post, I prefer not l to write about anything that I don´t own. There are however exceptions to every rule. I had an email from Hiram Green of Hiram Green perfumes informing me that there was a sample of his new perfume on its way to me. His work is consistently excellent and I have enjoyed each fragrance. Yesterday I had a call from a perfumista friend I trust one hundred percent, raving on about Arbolé Arbolé. And then I read Claire Vukcevic´s post, of Take One Thing Off and APJ. Shifting into perfume excitement mode, I waited anxiously for the postman. Arbolé, Arbolé takes its name from Frederico Garcia Lorca´s exquisite poem of the same name. It is new to me though written in 1955, and acutely expressive. I wish I could read Spanish. Arbolé Arbolé is so impressive I am speechless, sat here with my head in my hands wondering what to write. My husband just yelled from the living room “nicht zerreden”. Which means don´t talk it to death. He also said to order a bottle. I have never smelled anything that is remotely similar. I have been wearing it for six hours now, longevity is great. Hiram Green writes: “Arbolé Arbolé opens with a burst of earthy patchouli that slowly merges with dry cedar wood and velvety sandalwood. Vanilla and tonka bean anchor the fragrance and provide a sweet powdery base.” I guess he should know. Jump over to Hiram´s website and have a look. Hiram Green are offering Arbolé Arbolé in a 10ml travel spray along with a full bottle AND what is particularly brilliant is that you can buy all of the HG perfumes in 10 ml travel sprays. Superb. Our world has changed greatly since my last post. Political disaster encourages great music, so bring it on. PS. Hmmmmmm. A full bottle or 10mls, that is the question. I never order at night when the flesh is weak, tomorrow will tell. Watch this space!! grabs her around the waist. The girl won’t listen to them. and swords of ancient silver. roses and myrtle of the moon. And the girl won’t listen to him. Oh, what have you done? I love the poem, though it’s more beautiful in Spanish, and this sounds irresistible. One of those dear little 10 ml bottles will be mine! Love your husband’s advice, don’t talk it to death and order a bottle. Good man. Thanks for the review. It really does sound fab! A must try. Hey Val! Sigh….oh, I adore it. As you know. Unfortunately, the shipping cost to Ireland kills any idea I had of ordering the 10ml. So, of course, with perfect perfumista “logic” I am thinking it might make more sense just to order the 50ml! 🙂 Brilliant write-up, and you’re not making my longing for this abate in the slightest. Must. Sit. On. Fingers. Woo Hoo! Hiram Green can do no wrong. Oooh, what an exciting find. Love the poem and that quote from Leonard Cohen. We need perfume solace in this world gone mad so get ordering. It sounds divine and sometimes the most affecting perfumes can’t – and shouldn’t – be broken down. I think I might want that. Badly. Oh my goodness Val, I absolutely adore this post! Reading your words, the poem, and listening to Leonard Cohen as I contemplate the beauty of Hiram Green’s work … I love his fragrances and the aesthetic behind the line. 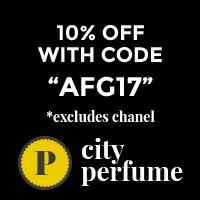 It seems to me that he always endeavors to reach out to the perfumista community and here he is offering 10mls of his entire line! This one sounds gorgeous, and thank you for the review. Ooh, I say… When Val is bowled over, we should all take note. Note taken. This is clearly so good they named it twice. I am with Vanessa, we should take note and will order a sample asap. Lovely word Muchacha, and Arbole too. Poetry in a bottle. Long time lurker and reader; perfume dilettante. But the REAL reason I’m writing: Pablo Neruda. Neruda was a 1971 Nobel Laureate; often held to be the greatest poet of this century writing in any language. One of the things he is best known for are his love poems. For my reading, they are the best modern love poems written from a man to a woman. Even read in (a good) translation, they are incandescent. Don’t wait for 2017… Do yourself a favor and get you and Hubby a stocking stuffer for the Holidays. You’ll be glad you did. His earliest love poems and perhaps the best known, is “Twenty Love Poems and a Song of Despair”; then twenty years later, “A Hundred Love Sonnets”. Less well known are “The Captain’s Verses” written to the woman he eventually married and, highly autobiographical, originally published annonymously. His work is widely avaiable on the Web. To rend your heart, try reading “Puedo Escribir” / “Tonight I Can Write”. If ANY perfumer could as successfully transmit the feelings of love that Neruda calls forth in his verse, they would be a millionaire and you couldn’t find a bottle at any price. How I love the perfume world* …. Val, thank you for your lovely reply. I’ve just returned from the grocer and am about to do battle with three or four dozen chocolate-chip cookies for tomorrow. I’ve also ordered my bottle of Arbole Arbole and she’s currently snuggling into a comfy box for her journey here. …At almost $40 per travel sample, I passed on those others for the moment but feel certain I’ll fill them in over time. 10ml is the perfect ‘sample size’ for me; one or two mls gets me nowhere. …Sometimes I think poetry should have blind-buy warnings as with perfume (which I ignore). But I can’t imagine your not finding some that speak to you. I’d love to hear which they are if you ever care to say… I’d mention mine here but don’t want to skew your first impressions as you read them for yourself. No mystery here. Maybe a bit of a Luddite though. I don’t have any ‘social media’ accounts like FB or Instagram. … Do you have access to the email address I type in below to make these comments? If so, feel free to contact me through that. It’s my real account —not a throw-away for making blog comments lol. I realize you may prefer not to do that for a variety of possible reasons. Your call entirely but it could be fun. I have passed your email along to Val. Be aware though that she is among the most solid and bright of my friends and knowing her can help make you a better person. Portia, Thank you; I greatly appreciate your doing so. I rarely write about anything I do not own: most often, those perfumes that I loved enough to buy are the ones that have a story to tell.